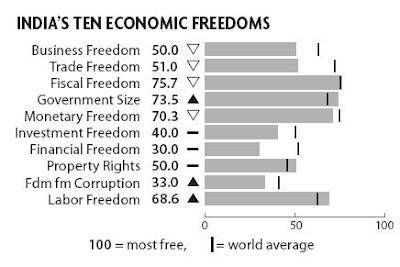 Random Thoughts: India ranked 115 in the Index of Economic Freedom !!! India ranked 115 in the Index of Economic Freedom !!! Covering “162 countries across 10 specific freedoms such as trade freedom, business freedom, investment freedom, and property rights”, the Index of Economic Freedom from the Heritage Foundation ranks India at 115 on a list of the 162 countries surveyed. [click here for the full list] But then, does India really deserve to be this low? I can understand the argument that developed countries would surely be ranked above India but then when a whole lot of countries from amongst LDCs, Africa and Latin America are all ranked above India, which generates only an abysmal score of 54.2% in a list which is topped by Hong Kong with 90.3%, I really wonder that either there is a serious error in the calculation of these figures or that there is something really wrong with the way we act. The ratings have been explained in the 422-page book titled similarly i.e. ‘2008 Index of Economic Freedom’ [click here to go to the downloading page for the full book] which seeks to not only illustrate the basis or rankings [for more, read the methodology adopted for the rankings] but also looks forward towards defining the future. Built in five plus one chapters namely; (1) Economic Fluidity: A Crucial Dimension of Economic Freedom; (2) Narrowing the Economic Gap in the 21st Century; (3) Globalization Is Making the World a Better Place; (4) Methodology: Measuring the 10 Economic Freedoms; (5) Economic Freedom in Five Regions; and (1) The Countries; the report in its last seeks to illustrate the views of its compilers in formulating the report and in the last accompanying chapter given an individually focused account of the reported countries. It is this last chapter that we are most interested in and particularly the view adopted in India, which has led to such a poor rating of 115. While the ‘freedom from corruption’ is understandably low, the low depth to which ‘financial freedom’ has been rated is really something which I really look with skepticism for the reason that has been assigned for the same is that “banks must lend to priority borrowers” and that “foreign ownership of banks and insurance companies is restricted”. Instead of being major influencers of financial freedom, I find the two reasons assigned as more of a western looking-down upon the way in which India has out-performed the major developed economies of the world given the fact (sic) that we have very restricted financial freedom. This really makes me wonder whether these reports are issued to encourage the countries to outperform each other by bringing positive changes in their system or to throw mud at ill-received countries. Just like saying on the face of it that we are ‘non-racists’ and ‘proud multicultural societies’ but then from inside really despising those not of the same colour or kind. But digressions apart, I serious doubt the credibility of the rating especially in the light of more factors, few of them being our property rights, business freedom and trade freedom being assigned lower percentage points than labour freedom. Further, unlike the comment on the other countries, there is not a word of praise or appreciation of the country’s performance and all that is written is either negative or portrayed as being worst off in the world. Nonetheless, as they say ‘when the sky falls, we shall catch lark’, similar is the rating which I would assign to this report. It is an exercise in retrospect and except for the other chapters of the book (some of which really look forward and relate the present to the future), I do not find any worthwhile use of the report either for potential investors or otherwise.